The small size of the PP-1 allows close placement to the turntable, minimizing signal leads from the tonearm. The whole power supply is inboard the PP-1 chassis except for an external power transformer, which is outboard to eliminate magnetic field interaction. The miniature size of the PP-1 also allows all circuit components to be very close to one another. This significantly reduces circuit board traces, which could introduce noise and sonic degradation. The PP-1 is optimized for moving coil amplification, thus does not provide switches and or jumpers for gain setting or resistive loading. This elimination of unneeded circuit junction points preserves the low noise/high performance characteristics of this superb phono preamp. By using only 2 transistors in each amplifier stage, perfect stability and extreme fast transient response is achieved. This provides the high degree of transparency and accuracy of the PP-1. High quality double-sided glass epoxy circuit boards with carefully designed topology (CAD) have been applied in order to ensure shortest possible signal paths. Low noise matched bipolar transistors were selected for this purpose. All resistors are high quality metal film with 1% tolerance. Within the RIAA network, only 1% polystyrene capacitors have been used, with high quality metalized plastic-film capacitors in the coupling function. Each channel of the input amplifier stage works around a phase non-inverting 2-stage negative feedback amplifier. Available gain is set at 40dB and the upper frequency limit has been set at 650kHz/-3dB. Input impedance has been set at 22k Ohm in order to eliminate interconnect cable and phono connector influence on the sound quality. A 10Hz sub-sonic filter has been incorporated between the input stage and the RIAA equalizer. As with the input amplifier, RIAA equalization has been achieved through an inverting 2-stage amplifier of ultra high accuracy (+0/-.5dB within the RIAA standard). Available gain is 22dB/1kHz and it has an extended high frequency roll-off. This section of the PP-1 connects directly to the output of the unit. Total gain of the PP-1 is 62dB, ideal for cartridges with output as low as .2mV. In his latest revision of the PP-1, Albert Lukaschek has redesigned the regulation circuitry of the unit's power supply, bringing across-the-board improvements in the areas of clarity, focus, and bass control. Integrated circuits are now employed only in the pre-regulator, which provides a constant 25 volts to the independent regulators for each gain stage, which are now implemented with fully discrete transistor regulators. The improved speed and impedance characteristics of these transistor regulators, which are now direct-coupled, bring across-the-board improvements in the areas of clarity, resolution, and focus as well as low frequency control, articulation and heft. The new active-load, constant-voltage-source regulator allows the first gain stage to function to its fullest potential. 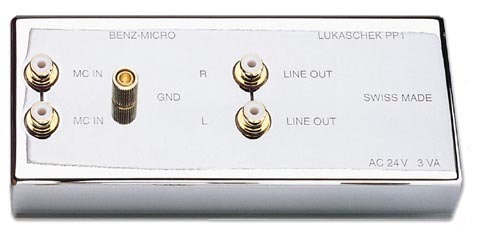 This linear amplifier stage can now utilize a full 100X gain factor, an increase in open-loop gain over previous versions, which allows not only for improved signal-to-noise performance (vital for high-gain phono stages), but also provides better coupling to the RIAA filter and output stage. This stage is also individually regulated with discrete transistors in a constant-load configuration. Lukaschek finds this new regulator, in conjunction with his polarity inverting RIAA filter, yields reduced distortion and a more exact implementation of the RIAA equalization curves. The increased resolution afforded by these improvements exposed previously inaudible artifacts due to circuit board layout. Lukaschek then spent a number of months optimizing component placement and circuit-board trace layout, before the final revision was complete. The net sonic result is a PP-1 of far greater refinement than any before. Tonal balance is slightly warmer than the previous versions, yet with far more resolution and extension. Bass is bigger and more solid; highs are effortless, open, transparent and totally devoid of smearing. Focus, soundstage depth and dimensionality, particularly on the edges of the soundstage, are much improved.